Aneeta Patel learned to knit when she was about 5 years old by her right-handed aunt. This means that she knits right-handed even though she is actually left-handed! It also means she has no barriers to teaching either left or right handed knitters. Aneeta originally trained as a painter and she’s always loved to sew, knit, embroider and generally ‘make things’. These days that 'making' takes up a large part of her life. She’s knitted original samples for several designers both in London and New York. Aneeta created Knitting SOS in 2006 as a free service for knitters in need of emergency advice. She feels strongly that sometimes a knitter will need a bit of advice to keep them going and she was keen to provide this as a free service rather than have knitters get 'stuck' and stop knitting for want of a little boost... so take advantage of over 30 years of knitting experience! Aneeta teaches knitting classes for beginners and intermediate knitters all around London - creating knitting-addicts wherever she goes. 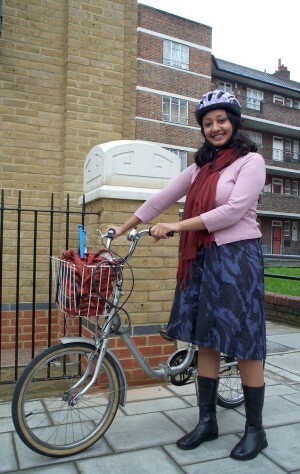 Aneeta has taught knitting for the Working Well Trust in Tower Hamlets. This is a charity where she taught knitting to Bangladeshi women with long-term mental health problems. The knitting provides a place for the women to meet and learn new skills and gain confidence. There are some women in the group who can’t yet speak English, but can read a knitting pattern. This is pretty cool. Aneeta was commissioned to turn her classes into a knitting book for beginners. 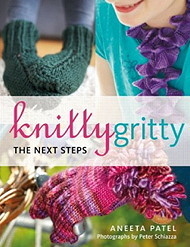 This is now available and will hopefully get even more people addicted to knitting! Aneeta was a member of the N1WI branch of the Women's Institute and has sat on the WI Education Committee at Denman College. 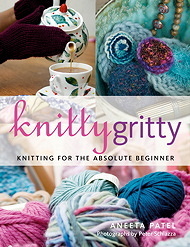 Knitty Gritty - knitting for the absolute beginner has proved to be a best-selling and well used knitting book by thousands of knitters. It's done so well in fact that Aneeta has been commissioned by A&C Black to knit and write a sequel which will be out in August 2012. For more details on classes, go to the classes page.